If you haven't decided what to make your husband for breakfast on Father's Day, you may want to go with these fluffy waffles. 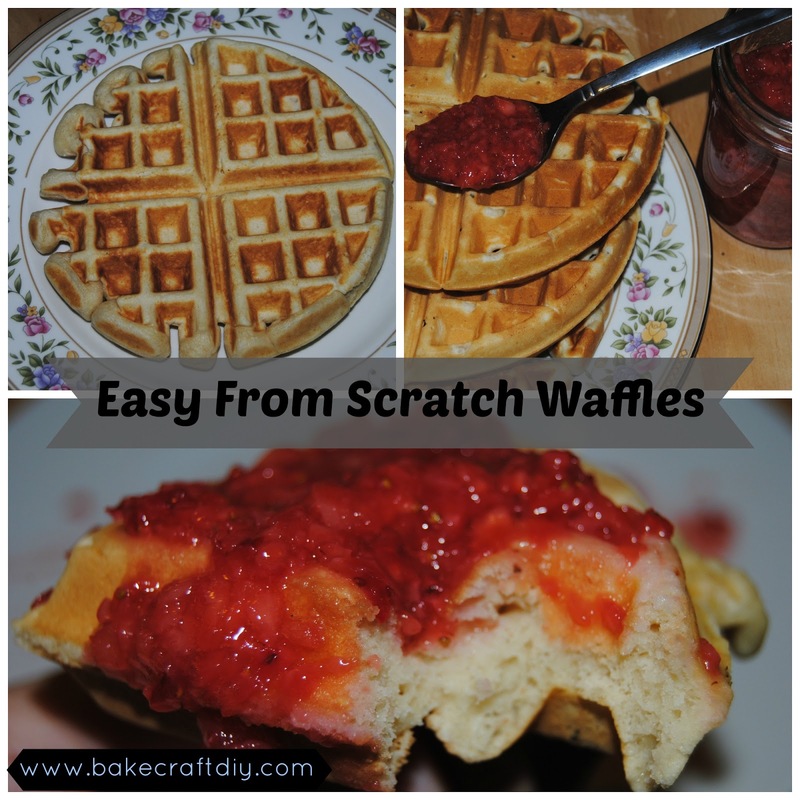 These waffles are so easy to make that I find myself making them more than once a week, as a bonus you just need a medium size bowl, fork, a measuring spoon and cup, and a waffle iron. They taste amazing plain but my husband likes when I add a scoop of chocolate chips to his and my son likes a couple of blueberries tossed into his. Adding fruit like blueberries can make a bit of a mess in your waffle iron but if you start with your fruit filled waffles you can "clean" the fruit off by making plain waffles. Waffles are the perfect breakfast food, but I want to try doing fried chicken and waffles sometime soon. With this waffle recipe it's bound to be absolutely delicious! The waffles in the photos have Strawberry Dessert Salsa on them but for something sweeter you can try this Strawberry Topping from my pancakes post or this blueberry jam. Add ingredients as listed, I like to beat my eggs lightly prior to adding the additional ingredients. Mix until no large lumps are seen. Pour about 1/2 C to 3/4 C of mix into the waffle iron, close and allow to cook. If your waffle iron does not have a time just watch for steam, when the steam slows, and is almost completely gone your waffle is ready. If you want to add chocolate chips of berries, add the waffle mix toss in the extras and close your waffle iron. The recipe is supposed to make about 6 waffles, I like big thick waffles so I tend to get between 4 and 5. I'm actually a bridesmaid in my friends wedding & we are looking for fun recipes & had a breakfast shower in mind. This would be great to make! They are so easy to make, and you could do a make your own waffle station, each waffle takes around 3 minutes. Otherwise if you make them ahead of time they make bigger waffle makers. Mine makes one at a time my sister-in-law received one as a wedding gift that makes 4 at a time. Best wishes to the bride! Waffles are the best, we even eat them for dinner sometimes. Your version looks delicious! Those look delicious! I love waffles and am always looking for a new recipe. These look delicious! I haven't had waffles in a long time. Bet really good with that strawberry topping! These look so yummy. Thanks for sharing I love waffles. Yum! I love waffles, and this looks delicious! These look amazing! I love waffles, I would eat them everyday. Ooh yum!!! i LOVE waffles! I cannot wait to try these! Thanks for sharing this recipe. Waffles are the best!! Thanks for sharing. I got a waffle maker for Christmas and have been trying all sorts of recipes, can't wait to try this one too! My boyfriend thought I hung the moon when I made him frozen waffles so I'm definitely ready to move up to a homemade recipe. This looks simple enough and super delicious. I gotta try that strawberry dessert salsa! What I like about the strawberry dessert salsa is that it tastes really fresh but has that hint of sweetness. My husband prefers the strawberry dessert topping on his waffles you can find it with my post on pancakes. I love homemade waffles. The moment you open up the waffle maker and see the crispy texture, it is addicting! These look great! For me, it's all about the waffle-y smell when it's cooking. So delicious.